Hello again, friends! 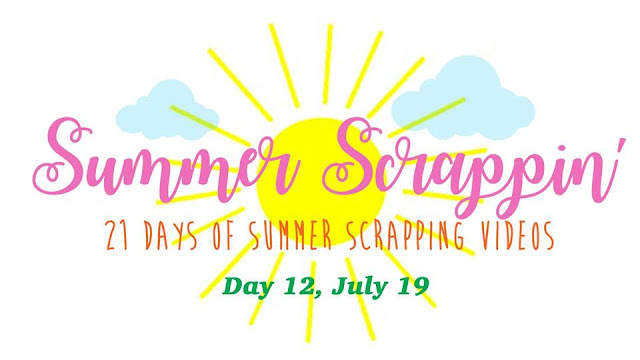 I'm so excited to be playing along with my wonderfully talented scrappy friend Audrey Yeager and her Summer Scrappin' Series! She creates 21 days of summer layouts and process videos and has a different designer join her each day. Today it's me, and I want to thank her for having me! I have to say I'm very excited about how my layout turned out! I've taken so many pictures of my girls at our pool over the years, and that means they have a ton of swim suits. I've had these pictures printed for a while, and I never really had a good idea about how to scrap them. Then all out of nowhere, I looked at them the other day and immediately got that light bulb over my head. I wanted to recreate her swim suit design as my background. It worked...woo hoo! Surprisingly, it was easy to make. I coated the white cardstock with clear gesso first. Then I used several different shades of blue and green Distress Oxide pads...I just scraped them across the page. The soften up the stripes, I spritzed the paper with water and then picked the paper up and turned it sideways. I didn't want the strips to blend completely because I wanted to emphasize the stripes in her suit. I have a large hibiscus flower stencil, and I placed that over the ink and dabbed white acrylic paint over it. I LOVE the results! I wanted something more to layer in behind the photos, so I used the stencil again to trace a smaller hibiscus onto some vellum. I used a white jelly roll pen, and you can see the tracing detail up close here. I fussy cut them out and layered them in. I curled up the edges for some extra dimension and then added in some light pink tangled thread. I almost didn't add in any pink, but I'm glad I did. If you haven't played with Distress Oxides yet, you need to! They are amazing, and they react with water in such a cool way. They really do all the work for you. This background looks like it took forever, but it really only took a few minutes. You can see it in my process video below! I dug through my older summer stash and pulled out a Simple Stories sticker sheet. I found this little floral sticker and it was the perfect colors. The flowers aren't the same, but who cares? It matched and looked great right there. I journaled with a gold pen. More stash here...I pulled out the Pink Paislee Citrus Bliss collection from a few years ago and found several die cuts that matched perfectly. I created a fun little cluster over on the left. That "chill" sticker was also the perfect colors...I had to make it work! It was on the Simple Stories sticker sheet. These splatters are a combination of the Distress Oxides watered down and some Shimmerz Vibez. And of course some gold Color Shine! I mean come on....look at that blue! I could never get sick of blue...it's definitely my favorite color. I did wind up adding in a tiny bit of striped patterned paper behind my photos...it's from a Fancy Pants 6x6 Paper Pad. I think it was from last year at least. For the title, I mixed and matched. I stamped "By The" using the Crate Paper Oasis stamps from several months ago. I dug way back into my Thickers stash and found an unopened pack of Dear Lizzy pink foam alpahs....again, the perfect pink color.